The suburb of Moncrieff is located in North Gungahlin and is bound by Horse Park Drive to the north and by the existing suburbs of Ngunnawal and Amaroo to the south and east. It is located approximately 3.5km north of the Gungahlin Town Centre. What will be in Moncrieff? Moncrieff will be developed by the Suburban Land Agency as a residential estate comprising a mixture of single residential, medium and high density Multi Unit developments, community facility sites, commercial zones and a Group Centre ultimately providing approximately 2,125 dwelling sites to the market. Moncrieff has a total land area of approximately 183ha of which approximately 67ha will be retained as open space. In addition to the more standard single residential zoning, a highly urbanised Group Centre located at the main intersection of Mirrabei Drive and Horse Park Drive is proposed to be developed along the lines of an “Urban Village”. To provide the necessary scale for this concept, a high proportion of medium and high density housing is proposed surrounding the commercial area of the Group Centre. Why has it taken so long for Moncrieff to be developed? As with other greenfield sites in Gungahlin, the development of Moncrieff was delayed for a number of years by the Commonwealth Environment Protection and Biodiversity Conservation process. That process has now been completed thus enabling work to commence. 400 dwelling sites in 2016 / 2017. The first blocks of land were released to the market in June 2014 with sites for approximately 500 dwellings made available to registered builders. These sites were released by ballot. Licensed builders registered for the ballot and purchased options on the blocks in packaged lots ranging from one to 13 blocks. These blocks can be purchased from the LDA through the builders. It is up to the builders as to how and when they choose to market them. Keep an eye on the usual real estate websites and publications for house and land packages. The first public release will be held in November 2014. Auction of selected Multi Unit developments / commercial sites. When will the general public be able to buy a block in Moncrieff? The first public release is currently scheduled for November 2014 with advertising commencing in September. Online registrations will open on Monday 22 September 2014 and close 4pm Tuesday 7 October 2014. The simultaneous construction of multiple stages will mean that the blocks released to the public will be ready to build on at the same time as those offered to the builders. Builders will also offer the option to purchase a block from the initial Builders’ Ballot in conjunction with a contract for them to construct the house on the block. This provides a variety of purchasing options for home owners. The LDA is selling land at market value and the value is determined by registered valuers. Will there be affordable options? 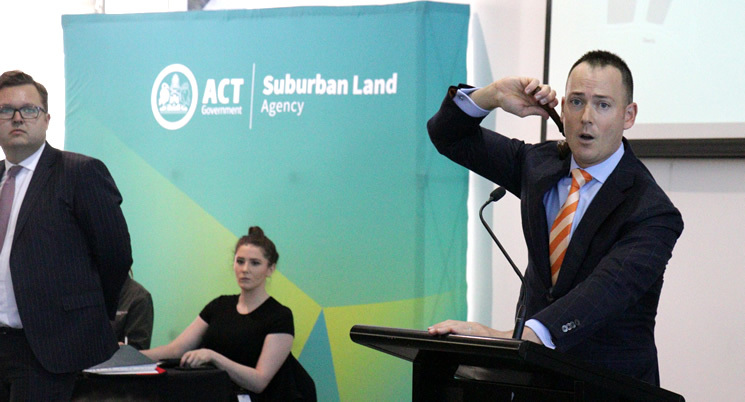 Moncrieff will contribute towards the ACT Government’s target of 20% affordable dwellings in Greenfield development sites. This will include dwelling sites strategically located around the estate and a requirement that Multi Unit developments will be required to provide affordable housing to the market. Land Rent options are also being included. Why did you sell the first 500 blocks to Builders? Offering sales options to the builders allows those people in the market who prefer to purchase House and Land packages an opportunity to work with a builder to design their home. Won’t this mean the builder will mark up the land value and take the extra profit? No, offering sales options mean that when a home owner has identified the builder and home design they want, the Builder introduces them to the LDA to purchase the land directly from the ACT Government at the initial price set by the LDA. I want a Land Rent Block – How do I get one? The retargeting of the Land Rent scheme means certain eligibility requirements need to be met (see https://www.revenue.act.gov.au/home-buyer-assistance/land-rent-scheme). It is expected that purchasers meeting these requirements will have the opportunity to purchase land via restricted ballots including certain blocks in the builders release. Will the builders buy all the Land Rent Blocks? No, the new eligibility requirements for Land Rent mean that builders will not be eligible to buy Land Rent blocks. Construction packages were generally packaged to allow for works to be completed within a 12 to 18 month period from when the tender is awarded. The first residents moved into Moncrieff in early 2016. How soon will I be able to start construction of my home in Moncrieff? The estate works commenced in the first half of 2014 and the first blocks are scheduled to be ready for settlement in mid to late 2015.